One of the most closely observed—and powerful—figures in the news business, Fox News Channel President Roger Ailes, is the subject of a 560-page biography being released today. Even before its publication, “The Loudest Voice in the Room” by journalist Gabriel Sherman has triggered jousting matches between Ailes’ legions of critics and defenders. 1Fox News was very tough on the last Democratic candidate for president. 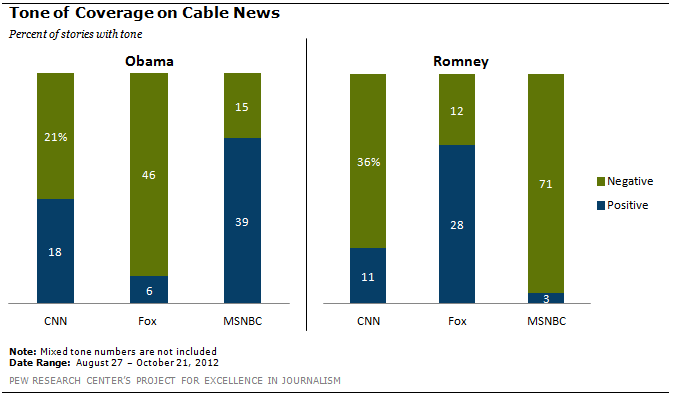 (But MSNBC was even tougher on the Republican). During the late stages of the 2012 presidential campaign, a Pew Research analysis found that Barack Obama received far more negative coverage than positive on the Fox News Channel. Yet Fox found its ideological mirror image in MSNBC. In the final stretch of the campaign, nearly half (46%) of Obama’s coverage on Fox was negative, while just 6% was positive in tone. But MSNBC produced an even harsher narrative about the Republican in the race: 71% of Romney’s coverage was negative, versus 3% positive. 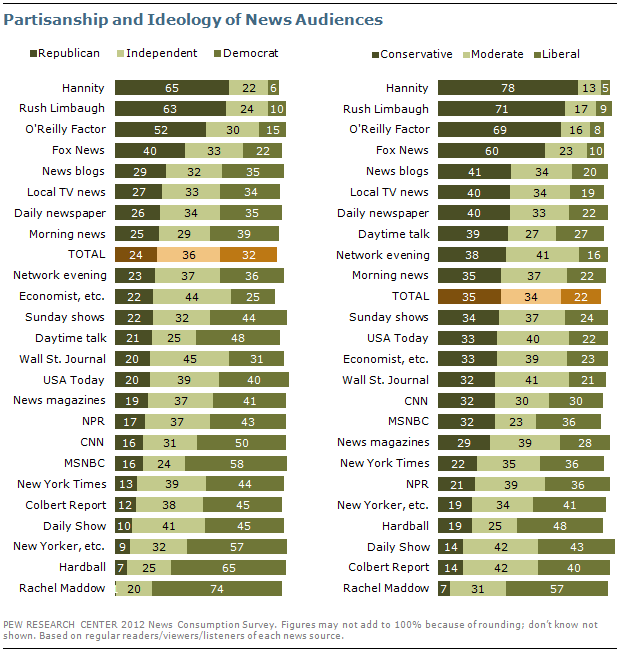 2The Fox News audience skews more ideological than that of its two main competitors. Fully, 60% of Fox News viewers describe themselves as conservative, compared with 23% who say they are moderate and 10% who are liberal, according to a 2012 survey by the Pew Research Center. By contrast, the ideological makeup of CNN viewers (32% conservative, 30% moderate, 30% liberal) and MSNBC viewers (32% conservative, 23% moderate, 36% liberal) is far more mixed. 3Fox News is expensive. If you’re a cable subscriber, you pay roughly 89 cents per month for the Fox News Channel, based on 2012 estimates provided by the industry research firm SNL Kagan. Cable channels generate much of their revenue from “license fees” they receive from cable companies in exchange for carriage in households. Those fees are passed along in subscribers’ monthly cable bills. Fox has aggressively negotiated its license fees, and now claims one of the highest average rates per subscriber. Only six non-premium cable channels command higher fees than Fox. CNN, by contrast, is estimated to average 57 cents per subscriber per month and MSNBC, 18 cents. 4Fox still leads in audience, but that audience is smaller than it used to be. In 2013, Fox’s prime-time viewership declined 6% from the previous year, according to median monthly viewership data provided by Nielsen Media Research. But with 1.7 million viewers each evening, the channel still drew a bigger audience than CNN, MSNBC and HLN combined. 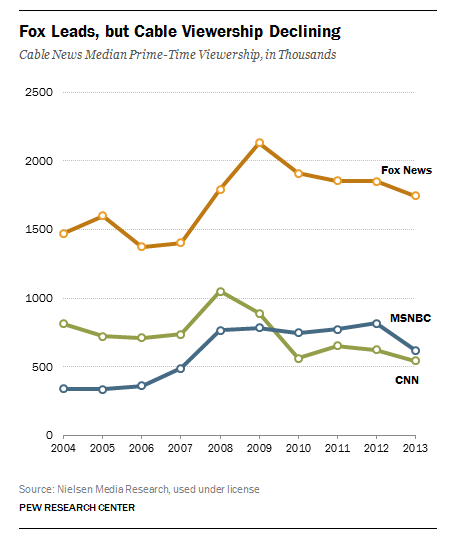 Fox surpassed then-leader CNN in prime-time viewership in 2002, and has never looked back. However, there is some evidence of a ceiling for audience growth. Fox has not increased its median evening viewership since 2009. 5Fox outspends its rivals. 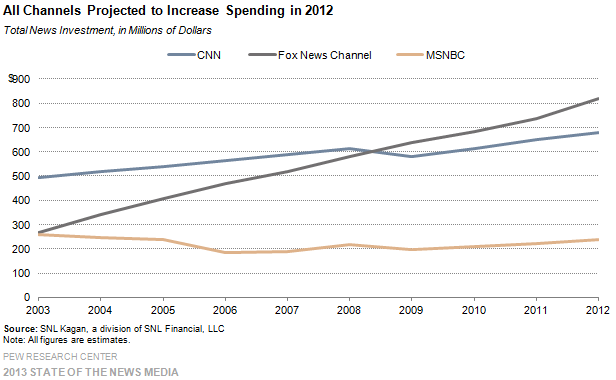 In 2009, Fox surpassed CNN as the cable news outlet that spends the most money each year. In 2012, the channel was estimated by SNL Kagan to spend $820 million—on everything from salaries for on-air talent to maintaining bureaus and keeping the lights on. That spending was up 11% from 2011 levels, according to Kagan data. CNN was estimated to spend $682 million on news gathering in 2012, and MSNBC, which draws partially upon the resources of parent NBC News, $240 million.